I was building a trivial LED matrix the other day for an MBED microcontroller (think Arduino-like). The usual problem is that my brain is faulty so I do all sorts of things in the wrong way. I take this blog as the opportunity to make up for what I learn just to make sure that I won't forget (and ofcourse to teach others if they are interested). Now, the problem is that when we deal with low level programming, most low level languages (C, C++ etc.) don't let you write numbers as binary in your code. You can't write printf(0b101) for example. You need separate libraries if you want to do that and that would be fine for our case. 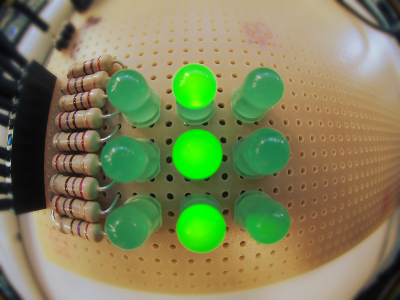 But imagine if there was a matrix of 100 LEDs. Someone reading printf(001001010101101010101010101010101110101001011100101) would just get lost in the 0s and 1s. That's one of the big reasons hex is used - it's super minimal. Notice that I omit the extra 0s since they don't add any value just like 000150 is always going to be 150 no matter how many zeros you add at front. The code I used, worked fine. The problem with this solution is that it's impossible to have a clue what an integer is in binary - and when we deal with low-level programming that matters most of the times. In our case for example each single 1 and 0 controls one LED. Being able to figure out fast the binary of a number in this case is very important. 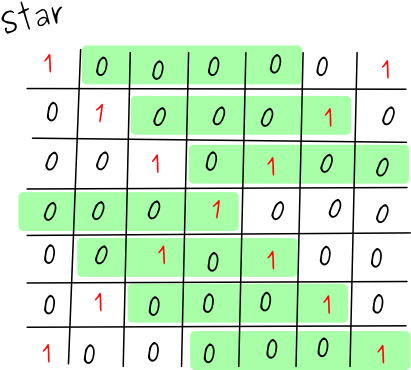 How can you tell if it's the STAR1 or STAR2 that looks like an 'X'? It's just impossible. And what if there were many more stars or if the LED matrix was huge? Then it would be a nightmare to understand the code. That's where hex comes in handy. A skilled programmer would directly see 0001 0101 0101 and 0000 1011 1010 with no effort. And he wouldn't either need to decode the whole number to find out. Watching just the last hex digit of each STAR would give him (or us) a hint about which STAR is which. It's time we become that skilled programmer, don't you think? Hopefully you get the hang of it. The question is.. what happens if we have 0x102? This might seem tricky since we get three very simple binaries: 1, 0 and 10. But as I said, if you add the 0s in front before you squeeze them together, you should get the correct value - in this case 1 0000 0010! Then it's quite easy to find in brain all the rest. For example to find the binary of B we can simply think that A is 1010, and that since B is just one step ahead, we add 1 to it and thus get 1011. Or to find 5 we simply have to add 1 to 4 which becomes 100+1=101. And so on. The below is more like an exercise to test what we've learned. It should be rather simple to find the hex of the star below. This was actually a trap to teach you the hard way that we should always start from the last digit. In this case in the end we are in a situation where we have an orphan digit 1. We can't work with that since we need 4 digits to make a hex number. The right way is to always start from the end. 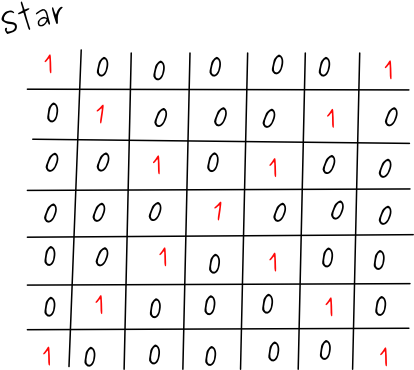 This is for all numbers no matter if they are represented in binary, octal, hex, decimal or whatever - as long as they are numbers, always start from the last digit and you'll do fine. The reason is that when you finally get to the last number you can add as many zeros as you like (or need) without altering the value of the whole thing. And then we just start from the bottom and get 1051141051141! 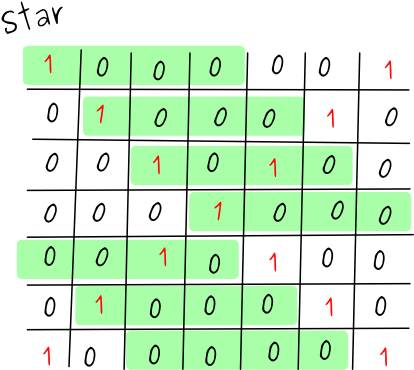 Notice that in the end we again have a single 1 (at the top left this time), but this time we can add as many zeroes as we want since adding zeros in front of a number doesn't change its vallue.